Christmas is more enchanting than ever in this new vibrant edition of Clement C. Moore’s heartwarming holiday poem that has delighted generations of children. Acclaimed painter Eric Puybaret captures the story’s magic and wide-eyed wonder in beautiful and bold illustrations. A cozy home with stockings hung by a mantel; visions of sugarplums dancing in the dreams of sleeping children; a miniature sleigh pulled by eight prancing reindeer; and of course, jolly Santa, with his merry dimples and twinkling eyes, coming down the chimney with a bagful of toys, all come to life with the turning of each page. Along with the beautiful book comes a specially created three-track musical and narrative CD, including Moore's tale stunningly set to music by Noel Paul Stookey, an enchanting reading by Mary Travers over a special score composed by Peter Yarrow with Peter and Noel joining Mary one last time in her final performance, plus the classic Peter, Paul and Mary holiday favorite, "A' Soalin." Families will gather together to read and listen and experience Moore's wondrous world as never before. 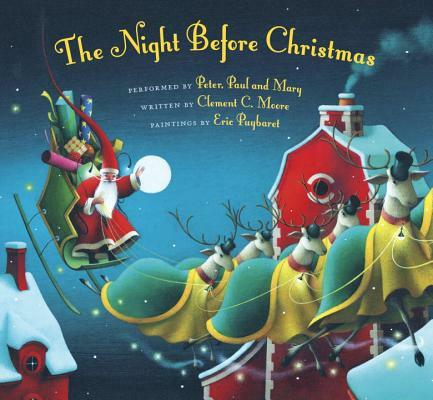 Clement C. Moore is the author of A Visit from St. Nicholas (now more commonly known as The Night Before Christmas). He was born in 1779, and became a professor of Oriental and Greek literature at what is now Columbia University. The poem was first published in the New York Sentinel on December 23, 1823.